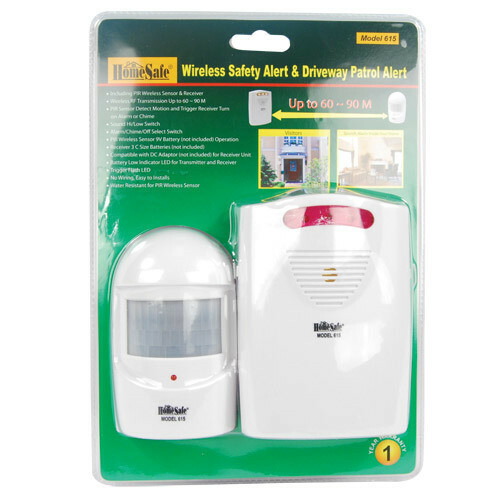 The HOMESAFE® WIRELESS SAFETY ALERT & DRIVEWAY PATROL ALARM has a unique passive infrared system that concentrates on the protected area you select. It can detect motion from up to 8 meters away and has 110 degree motion detection angle. Once movement is detected the alarm will turn on. The Driveway Alarm also has a chime mode to alert you as well. This alarm has many functions. It can be used to let you know when a child is leaving the home. It can be used to alert store owners when customers arrive. You can use multiple units in one location. Only one sensor can be used per receiver. Receiver works with 3 C size batteries (not included).